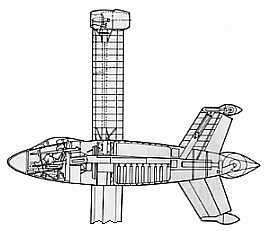 This Focke-Wulf VTOL (Vertical Take Off and Landing) fighter/interceptor was designed in September 1944. 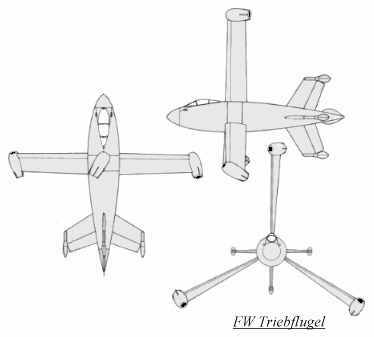 The three untapered wings rotated around the fuselage and had a gradually decreasing pitch towards the wingtips, thus acting like a giant propeller. At the end of each wing was a Pabst ramjet, Since ramjets do not operate at slow speeds, either the rotor had to be driven by a fuselage mounted takeoff-booster or small Walter rocket engines could have been fitted to each ramjet pod. The pilot sat in a cockpit near the nose and the armament consisted of two MK 103 30mm cannon with 100 rounds plus two MG 151/20 20mm cannon with 250 rounds. Although the Triebflugel was not constructed, a wind tunnel model was tested up to a speed of Mach 0.9.